A thriller’s pacing. Vivid Southern locales. Witty dialogue and wry observation about what passes for news on TV…and truth in our lives. Jolie Marston is a TV news reporter with scruples. Her new boss would sell his granny’s soul for a few ratings points. When he orders her to distort another meritless story, she explodes during a live broadcast. Her career is kaput. Blown too is her chance to cover Memphis’s biggest story of the year: the slaying of a respected former mayor. When the police investigation stalls, Jolie vows to find justice. She has a deep tie to the victim: He'd been mentor and friend from her hometown in the foothills of the Smokies. Reeling from her public downfall and a failing romance, Jolie returns to that small town to start a video business. She's also there to find out who she is now that the identity she took for granted is gone. Solving the murder becomes her proving ground as she unearths a life the ex-mayor’s public persona hidone of prostitutes, drugs and danger. Jolie chases down leads in sassy, blues-steeped Memphis, tiny antebellum La Grange and her east Tennessee hometown of Singleton. Her ally in sleuthing is Martin, Singleton's wealthy, clever, discreetly gay bon vivant. They find intrigue and deceit woven through generations and discover that exposing the lies people live by can have fatal consequences. Lies at Six is Sarah Scott's debut mystery. Look for the second Jolie Marston mystery soon. 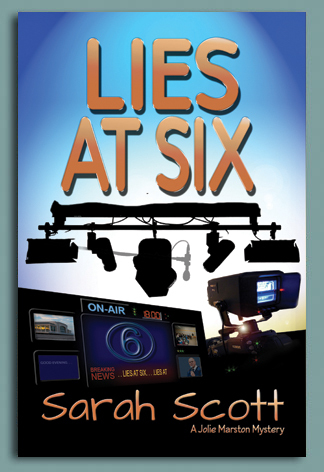 "Lies at Six took me back to my days as a TV news producer and the years I lived in the South. In her first noveland I hope not her lastSarah Scott does a terrific job with character, voice and setting description. Anyone who has ever worked in the news biz, been burnt out, had a boss they couldn’t stand, or had the rug pulled out from under their life, will connect with Jolie. Murder and mystery are icing on a seven-layer cake of a story." Carolyn J. Rose, author of Hemlock Lake, An Uncertain Refuge, and No Substitute for Murder. "A well-told, unusual story. A mystery which spans generations and moves to an exciting climax." "Not only does Sarah Scott keep her readers in suspense to the final pages, she does so with clever turns of phrase that intrigue and delight from the first pages to the last." "A rich and intriguing story straddling the complexities of the old and the new South. All played out from the gritty streets of Memphis to the foothills of the Appalachians." author of Memphis Blues and Cotton. Website Design: Catharine Gallagher | Copyright © 2012 All rights reserved.